Purpose is the master of motivation and the mother of commitment. When nations, societies, communities, friendships, marriages, clubs, churches, countries or tribes lose their sense of purpose and significance, then confusion, frustration, discouragement, disillusionment and corporate suicide -- whether gradual or instant -- reign. This is evident in our world. In every nation there is a generation that seems to have lost their sense of purpose. They are out of touch with the values, morals and convictions that build strong families, secure communities, healthy societies and prosperous nations. Thus, the moral fabric of most societies is being stretched and tested to its outer limits. You must realise that your fulfilment in life is dependent on your becoming and doing what you were born to be and do. For without purpose, life has no heart. Dr Myles Munroe has fashioned a compass that can focus you on the path toward fulfilment while providing the answer to the question, "Why am I here?" 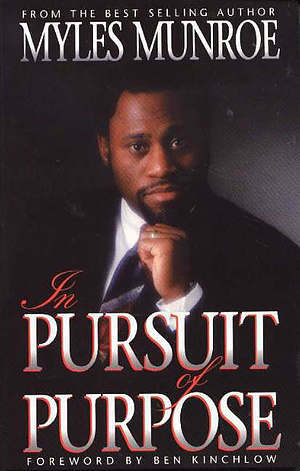 In Pursuit Of Purpose by Myles Munroe was published by Destiny Image in January 2003 and is our 16315th best seller. The ISBN for In Pursuit Of Purpose is 9781560431039. Be the first to review In Pursuit Of Purpose! Got a question? No problem! Just click here to ask us about In Pursuit Of Purpose.